ChatOn, Samsung’s own take on soon-to-be-Facebook-owned WhatsApp, is getting location aware after the Korean company announced a tie-in with Glympse that allows users to share their location inside the messaging app. The partnership bring ChatOn up to speed with rivals that offer location sharing, such WhatsApp, Line, WeChat and others. 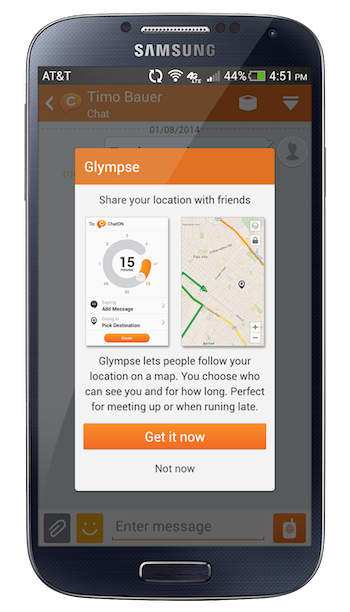 ChatOn users simply select the Glympse icon inside the service, which pulls up their location on a map that can be shared with friends. Samsung claims ChatOn has 180 million registered users, up from 100 million last September. The app comes pre-installed on a range of Samsung devices with standalone apps for iOS, Android, Windows Phone and other platforms. Samsung has never released active user numbers, though we expect that its customers are far more active on third-party chat apps than ChatOn.